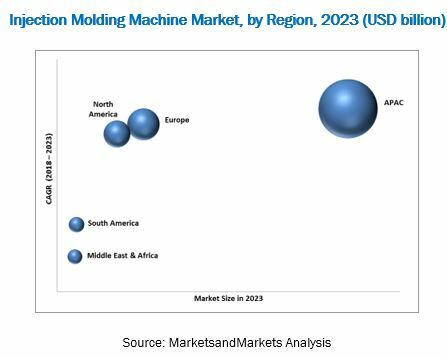 The injection molding machine market was valued at USD 16.72 billion in 2017 and is projected to reach USD 19.68 billion by 2023, at a CAGR of 2.9% during the forecast period. Injection molding machine is used to manufacture products made of plastics, rubber, metal, and ceramic. It consists of two main parts - an injection unit that is similar in function to an extruder; and a clamping unit that deals with the operation of the mold. Injection molding machine offers enhanced accuracy in manufacturing products, improved flexibility, and a high level of energy efficiency in the process, which help in manufacturing a wide range of products. There are various types of injection molding machines, including hydraulic injection molding machines, all-electric injection molding machines, and hybrid injection molding machines. The base year considered for this study is 2017, while the forecast period considered is 2018 to 2023. The growing automotive industry in the APAC region is one of the major drivers for the injection molding machine market. Injection molding machines are used in various automotive parts, including lighting systems, bumper, instrument panel, rear bumper, and still cover. The increasing demand for automobiles in the major APAC countries is fueling the sales of injection molding machines in the region. The demand for automobiles is mainly increasing in China, India, Indonesia, and Japan. This is propelling the growth of the injection molding machine market in APAC. China is emerging as the global leader in the production of automobiles. According to the International Trade Administration (ITA), China is projected to produce more than 27 million vehicles by 2020. The Chinese automotive industry registered a turnover of about USD 17.5 million in 2015. In 2017, India was the fifth-largest motor vehicle/car producer in the world. According to the India Brand Equity Foundation, the country’s automobile industry grew by over 9% from 2006 to 2016. These factors drive the injection molding machine market in the automotive industry. In this report, market sizes were derived using both, the bottom-up and top-down approaches. First, the market sizes for machine type (hydraulic, all-electric, hybrid), product type (plastic, rubber, metal, ceramic), end-use industry (automotive, consumer goods, packaging, healthcare, electrical & electronics, and others), clamping force (0-200, 201-500, 501 & above), and region (APAC, North America, South America, Europe, and the Middle East & Africa) were identified through secondary and primary research. The overall injection molding machine market size was then calculated by adding these individual market sizes. The value chain of injection molding machine market include raw material manufacturing companies such as The Japan Steel Works, Ltd. (Japan), GSH Industries (U.S.), Solmser Kunststofftechnik GmbH & Co. KG (Germany), and REP International (France). and others. These companies manufacture various materials such as ABS (acrylonitrile butadiene styrene), PC (polycarbonate), PP (polypropylene), elastomer, natural rubber, stainless steel, iron, copper alloy, and ceramic powder. The value chain also comprises of component manufacturers. Some of the global injection molding machine manufacturers also produce and supply injection molding machine components. Such manufacturers include Sumitomo Heavy Industries Ltd. (Japan), Husky Injection Moldings Systems Ltd. (Canada), The Japan Steel Works Ltd. (Japan), Milacron Holdings Corp. (U.S.), and Sinotech, Inc. (U.S.). Various components such as hopper, reciprocating screw, barrel assembly, and an injection nozzle are installed in injection molding machines. They perform particular function in this machine. After the completion of the production process, injection molding machines are distributed through in the market through different channels. Companies such as Haitian International Holdings Limited (China), Sumitomo Heavy Industries Ltd. (Japan), and Engel Austria GmbH (Austria) among others have warehouses in various regions across the globe, which has helped them emerge as the key players in terms of marketing & distribution of injection molding machines. These companies distribute their products with the help of their local sales offices and distributors, and provide aftersales services through their service centers. They also have their manufacturing units across the globe which helps reduce their logistics-related expenses and import costs to a great extent. The major end-use industries for injection molding machines are automotive, consumer goods, packaging, healthcare, and electrical & electronics industries, and others. In April 2018, Engel expanded the capacity of its Changzhou-based Wintec subsidiary and invested USD 11.9 million for this expansion project. This will enable the company to strengthen its market position and cater to customer needs. In April 2018, Arburg is planning to expand its Lossburg headquarter facilities. This will enable the company to cater to the rising demand for its injection molding machines. In May 2018, Sumitomo (SHI) Demag, a subsidiary of Sumitomo Heavy Industries Ltd. is planning to set up a subsidiary in Italy. This will enable the company to widen its presence in the country. In March 2018, Wintec, Engel’s Chinese subsidiary is expanding its presence in North America and Brazil. This will enable the company to widen its presence in these regions and deliver customized solutions. Key market players profiled in the report include Haitian International (China), Chen Hsong (China), Milacron (US), The Japan Steel Works (Japan), Sumitomo Heavy Industries (Japan), Arburg (Germany), Nessei Plastic (Japan), Husky (Canada), and Engel (Austria). This report categorizes the global injection molding machine market based on product type, machine type, clamping force, end-use industry, and region. What are new product and technologies injection molding machines companies are exploring? The injection molding machine market is estimated to be USD 17.08 billion in 2018 and is projected reach USD 19.68 billion by 2023, at a CAGR of 2.9% between 2018 and 2023. The growth of the market is driven by the high demand from the packaging industry, rising demand for energy saving, growing automotive industry, and advancements in injection molding technology. An injection molding machine is used for manufacturing products made up of plastics, rubber, metal, and ceramic. It consists of two main parts - an injection unit and a clamping unit. The injection unit is like an extruder, whereas the clamping unit is concerned with the operation of the mold. Injection molding machines can fasten the molds either at the horizontal or the vertical position. There are three types of injection molding machines - hydraulic injection molding machines, all-electric injection molding machines, and hybrid injection molding machines. They offer various advantages such as enhanced accuracy in manufacturing products, improved flexibility, and a high level of energy efficiency in the process. On the basis of product type, the injection molding machine market has been segmented into plastic, rubber, metal, ceramic, and others. The plastic segment is estimated to lead the injection molding machine market in 2018, in terms of value. The demand for plastic injection molding machines is primarily driven by the increased demand from the automotive, consumer goods, and packaging end-use industries. Plastic injection molding machines facilitate the fast production of plastic parts with reduced waste at lower costs. These machines also enable the use of a wide variety of material types such as nylon, polycarbonate, polystyrene, and polypropylene. \ On the basis of machine type, the injection molding machine market has been segmented into hydraulic, all-electric, and hybrid. The hydraulic segment accounted for the largest share, in terms of value, of the injection molding machine market in 2018. The dominance of hydraulic injection molding is expected to continue during the forecast period owing to its enhanced performance and low maintenance cost. Also, the increasing demand from the automotive, consumer goods, and packaging various end-use industries is fueling the growth of the hydraulic injection molding machine market. Asia Pacific is estimated to be the fastest-growing region for injection molding machines during the forecast period, in terms of value. 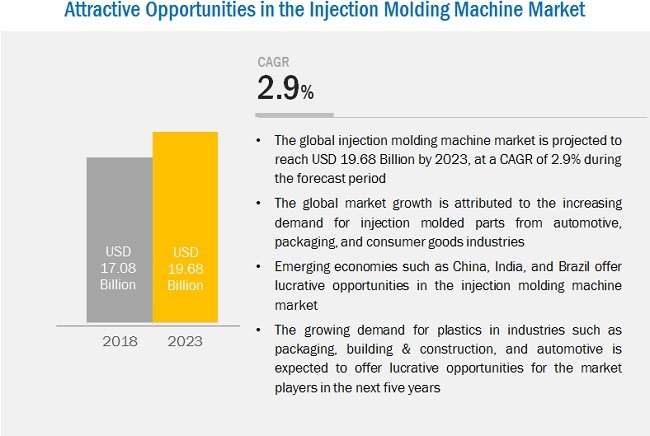 Rapidly growing end-use industries, competitive manufacturing costs, rising demand from the automotive industry, and high economic growth rates are the major factors for the growth of the injection molding machine market in this region. Injection molding machines are predominantly used in manufacturing automotive components, interior wrapping, and assembly parts, such as automotive exteriors, car lenses, interior components, under-the-hood components, and filter components. Plastics used in manufacturing automotive components are polybutylene terephthalate (PBT), polyethylene terephthalate (PET), polyvinyl chloride (PVC), acrylonitrile butadiene styrene (ABS), polyamide (PA), polystyrene (PS), polycarbonate (PC), and polyethylene (PE). A strong shift in the use of plastics instead of iron and steel in the automotive industry is expected to drive the injection molding machine market during the forecast period. Stringent government regulations have forced automotive manufacturers to use plastics instead of other materials such as iron and steel. Injection molding machines are significantly used in the manufacturing of consumer goods such as mugs, cups, toys, closures, cosmetics, personal hygiene products, stationery, kitchenware, footwear, safety gear, cosmetic articles, and household products. Thermoplastic materials such as PS, PP, PVC, and high-density PE are injection molded for producing various consumer goods. Moreover, the recent technological advancements in injection molding machines have helped to attain high precision and lower cycle time, driving the injection molding machine market in the consumer goods end-use industry. Packaging is an indispensable process for preserving and transporting goods. It caters to various sectors such as retail, institutional, and industrial. The packaging industry includes food, pharmaceuticals, consumer goods, and industrial applications. Changing consumer lifestyle and rising disposable income have increased the demand for packaged food, thus increasing the need for injection molded plastics in the packaging application. The availability of a wide variety of plastics and their adherence to regulatory standards make them the most extensively used material in packaging. Plastics can be molded into films, sheets, foams, and pellets. Highly efficient and high-speed injection molding machines are used in the packaging sector. Injection molding machines are significantly used in the packaging industry to manufacture packaging parts and components to increase consumer-friendliness and aesthetic value of the packaging products. Some of the packaging products include thin wall containers, lids, food storage, buckets, cosmetics, personal care, and specialty closures. What are the upcoming product type of injection molding machines? The use of injection molding machines for lower production capacities is less economical, which is a major factor restraining the growth of the market. 12.3 The Japan Steel Works Ltd.
12.8 Nissei Plastic Industrial Co., Ltd.
12.9 Husky Injection Molding Systems Ltd.
12.10 Dongshin Hydraulic Co., Ltd.
12.13.1 Nigata Machine Techno Company, Ltd.
12.13.2 Huarong Plastic Machinery Co., Ltd.
12.13.3 Fu Chun Shin Machinery Manufacture Co., Ltd.
12.13.4 Toshiba Machine Co., Ltd.
12.13.7 Toyo Machinery & Metal Co., Ltd.
12.13.8 Boco Pardubice Machines S.R.O. 12.13.9 Mitsubishi Heavy Industries Plastic Technology Co., Ltd.
12.13.10 Woojin Plaimm Co., Ltd.
12.13.11 Borche North America Inc.
12.13.12 Multiplas Enginery Co., Ltd.
12.13.13 Mold Hotrunner Solutions Ltd.